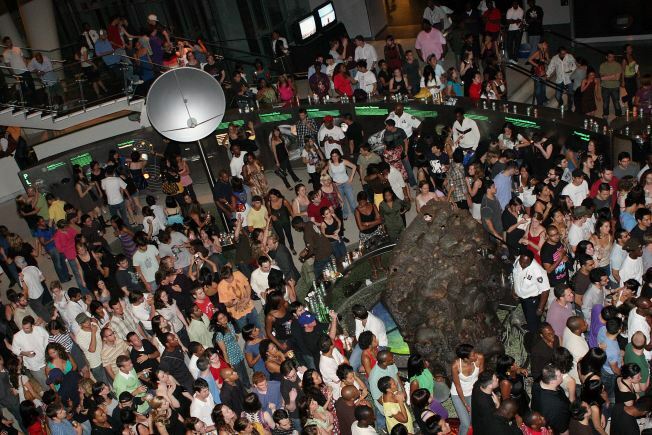 Fans watch the performance of Talib Kweli at BlackSmith Music: A Night at the Museum at the Planetarium at the American Museum of Natural History on June 27. As the weather warms up, more museums are staying open late, breaking out the bands and pouring drinks to keep their halls filled. The Metropolitan Museum of Art this week opened its Iris and B. Gerald Cantor Roof Garden for the season, compete with Roxie Paine's Maelstrom -- and a martini bar every Friday and Saturday from 5:30 to 8 p.m. The NewYorkology city guide today published a list of the museums with late-night hours for the spring, ranging from free Thursday nights at the New Museum to the monthly One Step Beyond 21-and-over parties at the American Museum of Natural History that rage until 1 a.m. Among the museums with new late-night hours is the Rock ‘N’ Roll Hall of Fame Annex, which will start midnight hours and a 7-day schedule starting May 12, when it debuts "JOHN LENNON: THE NEW YORK CITY YEARS," created by Yoko Ono.